I cannot believe I have a 6th grader and a 4th grader in the house. Yikes. I’m not sure where the time has gone! Here are our curriculum picks for 2016-2017 for all subjects (unless, of course, I’ve forgotten something, which has been known to happen!). By sharing these with you, I’m not saying that I think everyone should homeschool the way we do – absolutely not! If you find something inspiring, great. If not, that’s ok too. You know your family best. We use unit studies to cover all these subjects together. Both kids study the same thing at the same time. Sometimes my oldest has a few extra writing assignments to go a bit deeper into the subject, but for the most part, they do the same thing. My kids are only 19 months apart, and my youngest is very on the ball when it comes to this stuff, so teaching them together makes it easier and more interesting for all of us. I use Konos as my spine for ideas for hands-on activities, and I use both fiction and non-fiction books from the library as our main reading material. If I’m stuck on where to start, I add lessons from Currclick, Pinterest, and Google. Right now, we are studying New France – a Canada-specific topic that Konos (US-based) doesn’t cover. I’m using First Contact, a few dozen historical fiction novels, Teaching with Dear Canada, Canada a people’s history set 1 and set 2, and other miscellaneous things thrown in. We’ll wrap this up mid-September with a trip to Québec City (about a 5-hr drive for us) to visit the places we’re learning about. I’ve booked group activities at the Plains of Abraham, a few different museums, and in Old Québec. Incidentally, I have a few spots left for the group activities, so if that sounds like something your family might be interested in doing, drop me a note and I’ll give you more details. We covered Canada’s early explorers, pioneers, and First Nations people in previous years. 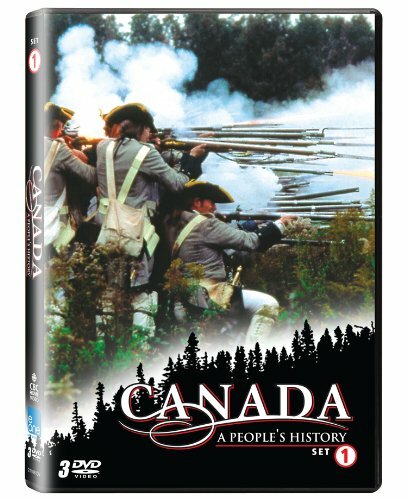 I just got the Timeline of Canadian History to Confederation as part of the All-Canadian Learning Sale, which is going to help tie these topics together. I wish I’d had the Explorers of Canada bundle (also part of the sale) when we did our explorer unit last fall – it would have made my life easier. I’ll have to tuck that one away for when we revisit some of the later explorers like Simon Fraser, George Vancouver, and David Thompson in a future unit. (UPDATE Aug 9, 2016 – links removed as sale ended yesterday). The unit studies we do in French are not nearly as involved as what we do in English. There are only so many experiments, crafts, activities and projects that this maman can handle! Our French topic studies have more reading and discussion with the occasional hands-on activity thrown in. I gather resources and books from various places and we spend about 15-30 minutes 3-4 times per week reading/discussing/writing/doing activities related to specific topics. I just got a subscription to Géniepublication, so I’m looking forward to incorporating some of their stuff into the above topics as well. Full review of their offerings coming soon. Also interspersed in there are stories & discussions from this series by Guérin. Each child has their own book that they are working through, but we read the stories together. We’ll do a few weeks on a unit study topic, then a few weeks of working through the books. We do some art with the unit studies, but by my kids’ request I’ve added in a few Artistic Pursuits lessons over the summer. I am not an art person at all, but I do enjoy these lessons as they are short and easy to do. We’ll continue those into the fall as often as we can fit them in. We’ve also really been enjoying the Famous Artists online unit study from Techie Homeschool mom. It features 10 artists and has articles, videos, and projects built in. We only do a lesson every once in a while, but my kids cheer when they see it on their list for the day. Math-U-See – My oldest is finishing up Zeta and my youngest is almost done with Epsilon. They go at their own pace – accelerating when they get the concept, and taking more time when they need extra practice. 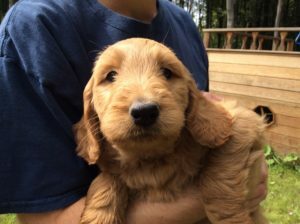 Life of Fred – We read 1-2 chapters a week with both kids together. We are currently working on the Decimals book, which lines up nicely with the Zeta book of Math-U-See, which is all about decimals. I like Life of Fred as it shows real life (and fun) applications of what Math-U-See covers in more depth. It’s a great combination for us. My oldest is working on the Continuation Level A from the Institute for Excellence in Writing, which I love. My youngest is plodding through Bob Jones English 4. I’ll be glad when he finishes the grade 5 book because none of us like Bob Jones. I stop them after grade 5 because I just don’t find it that useful. 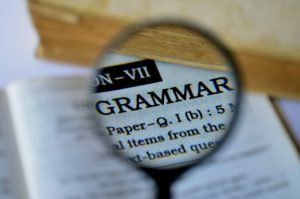 They are covering the ins and outs of grammar in French, and many of the concepts they are learning apply in English as well. I should probably get my 9 year old started on Spelling Power. Ugh. One more thing to fit in! 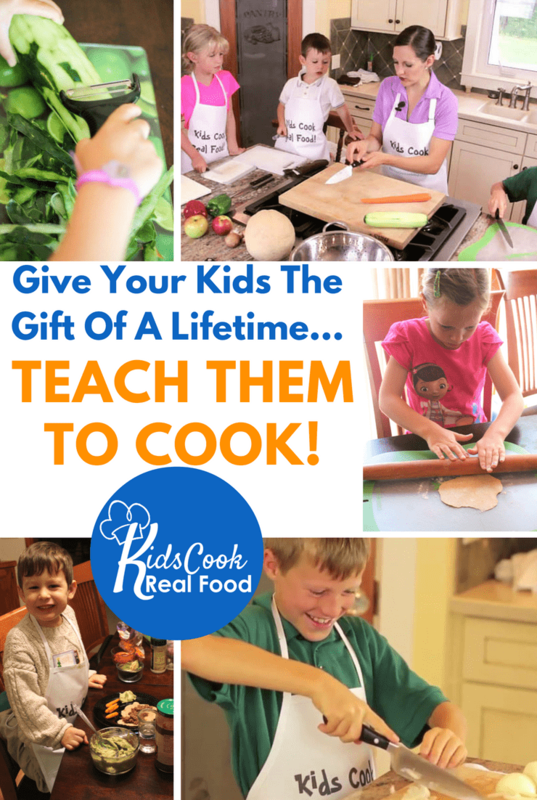 I bought the Kids Cook Real Food ecourse back in May and it’s the best thing I’ve bought in a long time. We’ve done 1 lesson each week that we’ve been home over the summer and I plan to continue it into the fall. My kids (and I!) have learned lots of new skills through this class. It’s going to be available again later in August. To practice cooking & baking and French at the same time, we’re going to get back into doing a French recipe per week as I wrote about here. We took a break from these over the summer, but will resume again in September when I’m willing to turn on my oven again. Each child reads aloud for about 10 minutes 4x/week, and I do as well. We are working our way through my readers list, with my oldest reading aloud one book from the Collection À pas de loup Niveau 3 – À grands pas, and my youngest reading one of the green books in Le Coffret des Grands rats series. Reading silently in French on their own for 20-30 minutes per day – they choose the books from the library (within reason). I don’t care if these books are silly, fluffy, or ridiculous – as long as they are in French. Popular choices include the French versions of Geronimo Stilton and Captain Underpants (groan). My oldest just started a new series by Holly Webb – the book beside her bed right now is Emily et le miroir magique. A few months ago, I started getting them to log their reading. They fill out a sheet as they go and submit the log to me once a week. For reading comprehension, once a week they each do one story and related questions from Questions de Textes by Envolée. Grammaire de Base and Mon Babillard (review coming soon) – we alternate between these books with this sequence: GDB 3, GDB 4, Mon Babillard cycle 2 cahier B, GDB 5, Mon Babillard cycle 3 cahier A, GDB 6, Mon Babillard cycle 3 cahier B. Note that in Québec cycle 2 = grades 3&4 and cycle 3 = grades 5-6. I have been quite happy with the way these books are laid out. They get to the point quickly and explain things well. Sometimes I need to supplement extra practice on some of the concepts. I do this with apps or other worksheets I find online for whatever topic my student is having difficulty with. One (occasionally two) per week of Apprivoiser la dictee by Envolee. My oldest spends about 10-15 minutes 4x/week. 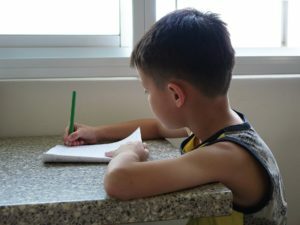 She writes a story with a minimum of 20 sentences – rough copy one day, I correct it that night, and then good copy the next time. When she first started this, I used writing prompts from Mille Merveilles. Now that she’s outgrown those, I’m mixing in a few different books: Plaisir d’écrire by Éditions Marie-France (started – review coming soon) and Écrire simplement by Génie Publication (not started yet ). Over the summer, I used a few Minecraft writing prompts that I translated and those went over very well, so I may add a few more as I find time to hunt them down. I don’t know enough about Minecraft to make them up myself. Each child spends 10-15 minutes 5-6 days per week working with some kind of app or website in French. In the early days, it was vocabulary practice. Lately, it’s been verb practice with Takaverbe or Conjugaisons. The kids watch about 20 minutes of TV in French 6 days per week. They choose what they watch (within reason). Recently, it’s been Garfield (Youtube), Lego Chima, and Star Wars the Clone Wars (DVD’s from the library). I also try to sit down with them and watch one French movie per week when I can get something suitable from the library. I chose the day we spend the most time in the car and that’s the day we listen to French music while we’re driving. It works out to be about 90 minutes that day. We listen to other music the rest of the week. I’ve got some French music suggestions here and here. 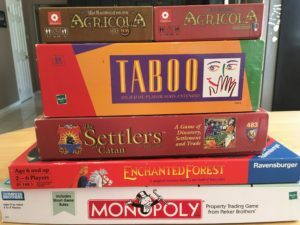 Yes, board games count as curriculum in our house! We play 2-3 per week in French. I wrote more about how we do this here. I speak to the kids in French for a few hours each week while we’re going about our daily activities not included above. They are also required to speak to me for a minimum of 55 sentences each day outside of other “official” French activities. Read about how we got that going here. Keeping all this stuff straight can be a bit overwhelming. I use a website called Toodledo to keep my sanity. Each kid has their own task folder where I set up recurring tasks for what they are supposed to do on various days of the week. The lists sync to every mobile device we have in our house via the Toodledo app so they can easily check what they need to do. 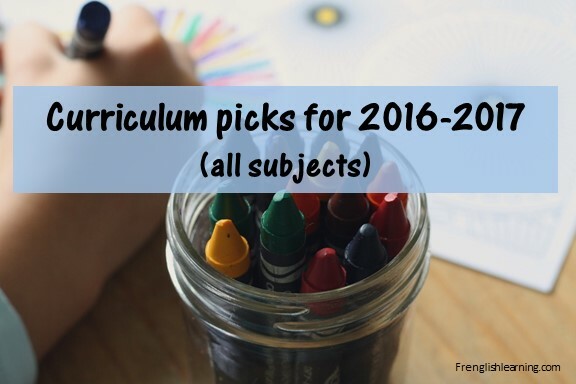 What curriculum do you have lined up for the coming school year? 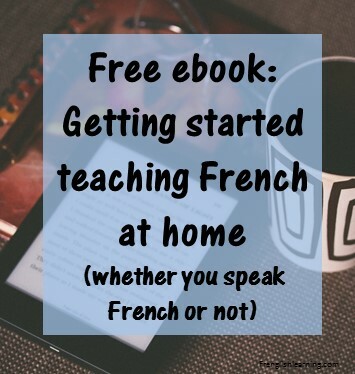 This entry was posted in 11+ years, 7-10 years, Advanced, Bilingual parent, Books, Curriculum, Immersion, Intermediate, Other, Parent speaks some French by Leanne. Bookmark the permalink. Wow! You do more French than I do and we homeschool IN French! 🙂 Good job. I’m very impressed. 7 grade math: Point de Mire ( a math program used in quebec schools. I like it. It is well done). Science. I am using “Origine” (a curriculum used in Quebec schools) as a spine. We will supplement with experiments and documentaries. We will start studying literature with “Fleurs d’encre 6e”, a program out of France. It looks a little to intense for us so we will take 2 years to get through it. Science and literature: we will use the 7 th grade curriculum and just adjust expectations. All my children will also be doing gymnastics, theatre and music in French. Art will be taught by an English speaking artist. Have a great bilingual year everyone! Thanks for that info! A few of our choices only go up to 6th grade, so I’m going to need to find some new things when grade 7 rolls around. I’ll also take a peek at some of the younger options you mentioned and put them in a future post for those who are just starting out. That looks like a great list! I love math u see for my daughter and Singapore for my son. This is my first year trying out Learning Language Arts Through Literature. For history, I love Story of the World with the activity book. I usually find French unit studies at teachers pay teachers or other places to go with the history topics. I enjoy using the “Let’s Read in French and English” books. My daughter reads aloud in French and tries to translate, then she reads in English. Whatever science topic we’re doing, I can usually find some French worksheets to go along with it. Sequential Spelling is a favorite for me. I put the word list in a spelling app. I don’t use the student book. Whatever we’re learning, I try to find the topic in French on youtube. I take a French vocabulary list or open up a page of Usborne First Thousand Words in French and play with my daughter’s Calico Critters. We try to only speak in French. Each day, a sous chef is assigned to help in the kitchen. The assignment app seems like a good idea. I might try that. Last year each child got a notebook where all their assignments were written in. I’d like to be able to have something where they can click internet links directly from an assignment list to read or work on something. For fun French writing, my daughter has a “My Fairy Doorway”. Her fairy is French. We write letters to each other in French. It’s not graded or corrected- just fun. I didn’t know Star Wars Clone Wars was in French! My kids will love that! Thanks for sharing your list! Great list, Kate. Thanks for sharing! I really like the French fairy and the letters – I may try that, too. :-). For the assignment app, you can absolutely put Internet links in there – I often put them in the notes section of the task, and because there is a website/desktop version, it’s really easy to do. I am SO thankful to have found your blog! We are not French immersive, and I can’t say more than hello, how are you, in French. But my oldest daughter (10) desperately wants to learn French, and her friend also. So I have begun testing the waters this year. We teach all subjects in English, except French. I am currently getting the girls into DuoLingo (can’t say much for its pronunciation!) They do that daily for 20 minutes. Then twice a week they work on grammar and vocabulary with a Canadian French homeschooled program called Noisette the Cat. I give dictation twice per week. Then we have about a 30-60 minute Live Lesson together where we all try to speak French. I also want to add in an audio book twice a week, but can’t find any on Kindle. Its amazing how hard it is to find French resources for kids in the US. My hope is to add on little by little as you have done over the years. Perhaps she will be a fluent French reader by 18, even if our pronunciation is terrible. Thanks for the details! Its been very helpful for me.